I have a 2015 Polaris Ranger 900 XP, when putting it into Reverse it seldom takes right away.....feels like its in between gears or in neutral or something. Sometimes I put it in and I can hear a slight gear grind and then it goes in but is never consist. Its been like this since new, never had an issue with it and I change my own oil so Ive never had the Polaris shop look at it. Is there any type of Linkage adjustment for this? Rockit401 and MonquartOutfitter like this. That's Awesome!!!!!!!! Makes total sense, Thank you!!!!!! Get yourself the gated shifter kit. It gets rid of all the fumbling of trying to find the gears and is a great help when plowing snow when you are going from low to reverse. it costs about $100 and takes a couple of hours to fit. Sounds like the gated shifter was a stab at fixing the detent issue. 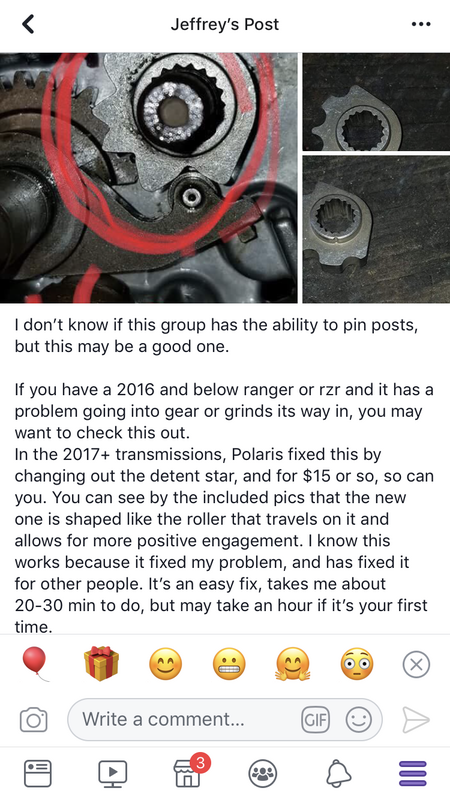 "Sometimes I put it in and I can hear a slight gear grind and then it goes in but is never consist. Its been like this since new..." Yeah. Me too. 39 years now. But that's probably for another forum. Naa thats BS My 2015 XP900 was always hit or miss when trying to find low or reverse. The gated shifter kit totally fixed it. No more fiddling with the shifer, just slam it from low to reverse and back and never miss. UpNorth2 have you tried this ? No a friend did have it installed in his 2016 says it makes it work like it should. I did work the shift lever it is very positive it does require a little more force to change gears. I plan to install in mine. Thanks for the reply. I ordered the part and am going to do the install myself. Going by the service manual It looks pretty straight forward to get into it. Be careful with that spring under the arm when removing the parts it will go flying.